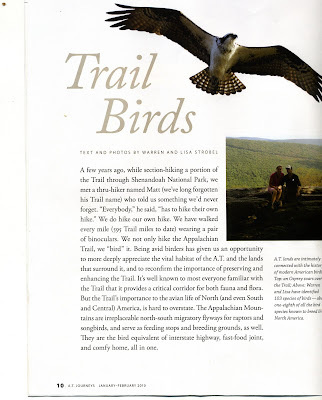 No, we are not out hiking the A.T. in January search of birds, but we are super proud to be featured in A.T. Journeys, The Magazine of the Appalachian Trail Conservancy this month! We do hike our own hike. We have walked every mile (595 Trail miles to date) wearing a pair of binoculars. We not only hike the Appalachian Trail, we “bird” it. Being avid birders has given us an opportunity to more deeply appreciate the vital habitat of the A.T. and the lands that surround it, and to reconfirm the importance of preserving andenhancing the Trail. It’s well known to most everyone familiar with the Trail that it provides a critical corridor for both fauna and flora. But the Trail’s importance to the avian life of North (and even Southand Central) America, is hard to overstate. The Appalachian Mountains are irreplaceable north-south migratory flyways for raptors andsongbirds, and serve as feeding stops and breeding grounds, as well. We are particularly proud to be associated with the The Appalachian Trail Conservancy and the work they do to protect a corridor of the East Coast for birds and the habitat they depend on. An organizaton that is largely supported by hikers, but is well deserving of the support of birders for their work in conservation and education.